One of our favorite days every year is Community Service Day. All of our Windermere offices close so the brokers and staff can spend the day volunteering with local non-profit organizations. 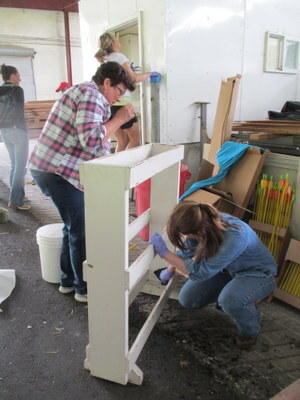 This year, our Windermere Bellevue South office will be spending the day helping out Mamma's Hands. Mamma's Hands was founded to provide hope and support to those in crisis. Their mission is to help those in crisis regain their self-respect, and to provide them the support and direction they need to become productive members of society. Their vision is "Hope in Every Individual." To accomplish this mission, Mamma’s Hands has created two programs: The Phone Home program and the House of Hope program. This year marks their 25th year anniversary of helping those in the Puget Sound area! Windermere Bellevue South brokers and staff have a lot of work ahead of them. Mamma's Hands has three homes for women and children in crisis on 15 beautiful acres in North Bend, and that's where they'll be for Community Service Day. They'll be helping Mamma's Hands by installing security cameras, staining eves, installing base trim, and installing cabinets and shelving. They'll be building deck railings, roofing the shed, and doing plenty of yard clean-up by weeding, mowing and preparing the flower beds for summer. It should be a great day to accomplish a lot! Want to learn more about Mamma's Hands? Visit their website or follow them on Facebook.